Life continues to slowly return back to normal. I re-opened my State shrine on Sunday. I am still only working a part-time priest’s schedule, as I ease myself back into normal life. Having been away for so long, I expected I would have forgotten how to do the Rite; I expected I would have been awkward, stumbling through the ritual haltingly, like it was my first time. I was surprised to find tht it was as though I hadn’t spent a day away — much less more than half a year. There were some things that were more clumsy than they had been, but I suspect that had more to do with the changes I made to the shrine in reopening it. As a gift to the gods, in gratitude for the ability to serve them, I was able to get Them the Icons they have been wanting to use; I also commissioned a pair of paintings for Them. I am absolutely thrilled with the paintings, and so are They. The paintings were done by another Kemetic Orthodox Shemsu, whose work can be found at her Etsy shop, Fall to Earth. 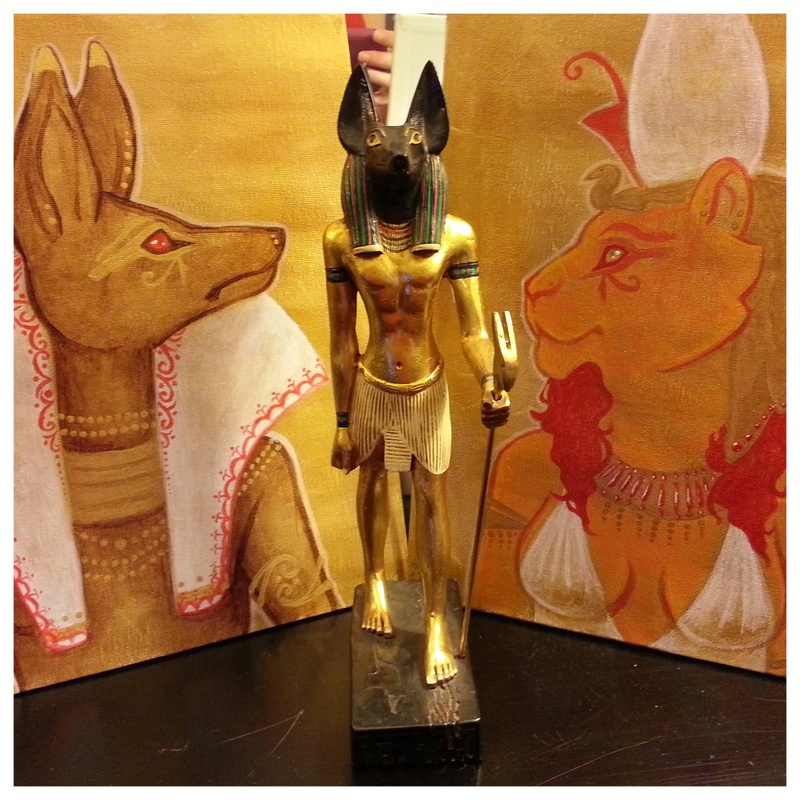 Paintings of Wepwawet and Sekhmet-Mut, and the Artisan’s Guild statue of Wepwawet-Yinepu. Part of me feels guilty only returning part-time; the other part knows that I would burn out way too fast if I dove right back in. I worked my way up to a daily rite when I first applied to the priesthood. I started with weekly Senut, and eventually shifted to daily Senut, in preparation for the daily Rite. So I pace myself. I look forward to sharing more of my experiences here, as I have them with the gods. And what was Their reaction to my return? It was quieter than I expected. We spent time together, and the candlelight was brighter than I remember. And that was good.